From Popfun. Remember when you could walk into a fast-food restaurant, pay a few cents extra, and get a real glass featuring your favorite comic-book or cartoon character? Remember how much fun was it to go back every week to see which glass would be released next? 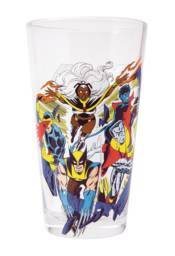 Well, you might be grown-up now, but PopFun is bringing back that fun to your favorite barware with 'Toon Tumblers, featuring your favorite classic X-Men on high-quality pint glasses! Each glass holds 16oz. of liquid and stands about 5 3/2' tall. X-MEN VOL.11 UNCANNY (#189-193/ANN #8 & VARIOUS) DM VARIANT X-MEN VOL.8 (MISC. PRE NEW X-MEN) NEW ED.